‘Kingdom of Ife: sculptures from West Africa’ opened yesterday, March 4th, at the British Museum. Showcasing nearly 100 pieces of Ife sculpture, drawn almost entirely from the collections of the National Commission for Museums and Monuments in Nigeria and most of which have never been seen in the UK before, the exhibition is unique and fascinating. The complexity of the sculptures is astonishing; the insight which they provide into the history of the city-state of Ife and West African culture from the 1200s to 1400s is intriguing. European fascination with African art began in the late 15th century following the Portuguese discovery of the kingdom of Ife. Travellers to western Africa took works of art back to Europe where they were displayed as ‘curios’. There was a renewed interest in African art in Europe at the beginning of the 20th century, notably as artists such as Picasso and Matisse sought new inspiration and studied masks and figures from Africa. One of the first European ethnographers and explorers to travel to Ife was the German Leo Frobenius. He arrived in late November 1910 as part of the third German Inner African Exploration. Frobenius spent three weeks carrying out excavations and unearthed numerous stone and terracotta sculptures. Further research into the nature and origins of African art began after the discovery, in 1938, of a cache of brass and copper sculptures. The kingdom of Ife is located in southwest Nigeria, south of the river Niger, and is regarded as the spiritual heartland of the local Yoruba-speaking people. It first emerged around 800AD and flourished as a powerful city-state on the crossroads of local and long-distance trade routes from the 12th to the 15th centuries. Legend traces the foundation of the kingdom of Ife back to the supreme god Olodumare, who allegedly asked his son Orishanla to create the world equipped with an iron chain, a snail shell filled with soil, a chicken and a chameleon. When Orishanla drank too much and fell asleep, however, his brother Oduduwa took over. Oduduwa climbed down the chain from the sky onto the watery land and emptied the soil from the snail shell. When the chicken kicked the soil around, dry land appeared and the chameleon tested the firmness of the land. Orishanla then created human beings and Oduduwa founded the kingdom of Ife. 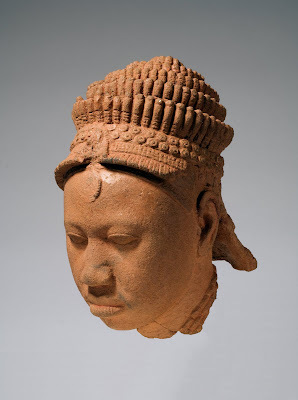 Ife is also considered the birthplace of some of the highest achievements of African art and culture. 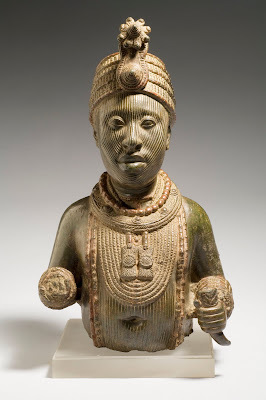 The stone, terracotta, brass and copper alloy sculptures on display depict human figures from a wide cross-section of Ife society and provide a fascinating insight into local customs and beliefs. Some of the figures have unusually large heads, for example, in accordance with the belief that the head should be emphasised as the source of spiritual power and destiny. A highlight of the exhibition is a collection of 15 almost life-size copper-alloy uncrowned heads, which date back to 1200-1400 and were made using the highly complex ‘lost-wax’ casting technique. They were discovered in 1938 and the Ooni (ruler) of Ife at the time, Sir Adesoji Aderemi (1930-80), agreed to send them to the British museum for display in 1947-48. They were thereafter returned to Nigeria where they formed the nucleus of the collections of the National Museum of Ife which opened to the public in 1954. 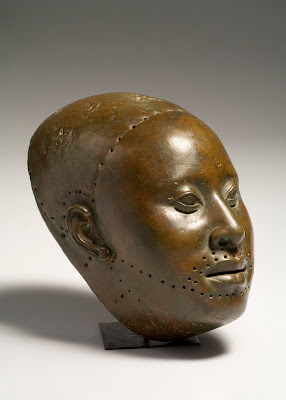 One of the sculptures is a copper mask of the third king of Ife Oblafon II, who ruled in the late 1300s and early 1400s, weighing over 5kg. Slits are carved below the eyes of the mask which may be evidence that it was made to be worn. Despite the insights into the culture and social and economic organisation of the kingdom of Ife which the exhibition provides, the city-state remains largely a legend. Knowledge about the history of the kingdom is primarily based on oral sources - epic tales, prayers, songs and mythical narratives, which were only recently written down. The true significance of the sculptures is unknown and locked in glass cases they seemed removed and somewhat misunderstood. I left the exhibition frustrated and lacking a deep understanding of the culture and history of Ife. The sculptures reminded me, in many ways, of the ‘curios’ which Europeans brought back from Africa from their very first journeys on the 15th century.